A rock fortune inspires family betrayal and murder. Cleo Cooper is either about to strike it rich or lose it all. Discovering a huge and rare granite deposit is a geologist's dream come true. The multi-million dollar quarry deal will also benefit Cleo's friend Gladys Walton, who owns the rural North Carolina property. So what could go wrong? Finding a dead body in Gladys's well, for starters. A hitchhiking rattlesnake and a near-fatal accident during the drill test convinces Cleo that someone is dead set on scaring her--and halting the project. The two likely suspects? Gladys's greedy, grown children, Robert Earle and Shirley, who try every dirty trick in the book to cash in on the granite-rich land. But are they nasty enough to resort to murder? Between romps with a hot geologist, Cleo devotes every fiber of her being to keeping Gladys safe--and keeping her dream alive. Cleo Cooper, divorced mother of two and geologist turned amateur sleuth, rocks in Lee Mims' debut mystery. Action, drama, and science has never come together quite so entertainingly as in Hiding Gladys. 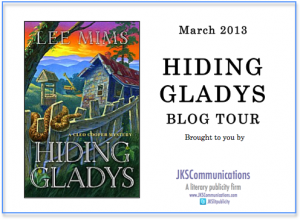 Hiding Gladys begins with a bang when Cleo's caught on the road with a rattle snake slinking through her jeep as she's heading towards her latest job. She's found granite on her friend Gladys Walton's land and is expecting a big payout if her testing results are conclusive. While setting the land up for testing, Cleo stumbles across a dead body. Investigation begins and the hunt for Gladys, an important key to this twisted mystery who seems to have disappeared, ensues. Mims keeps her readers in suspense, but the story keeps moving. While Cleo sorts out whether Gladys' rotten children are trying to remove their mother from the picture, she's either working on the land or working to avoid her ex-husband, Bud. She'd rather rely on fellow geologist and ex-army ranger, Nash, to get her out of a jam. Along the way she keeps her eyes peeled for clues and answers to the questions forming the big picture. Geology isn't the first subject you'd expect in mystery, but Mims makes it work. The explanations of Cleo's work is far from humdrum, but intriguing substance to fill the story's atmosphere. The one thing that was hard to imagine was this 45 year old woman running around and fulfilling some very physical scenes. It helped that her field has made her used to such activeness, but I couldn't help slipping up and imagining her as a spry 29 year old, at least. The first Cleo Cooper Mystery is a charming mystery, one that you would do well to get a hold of as soon as possible! 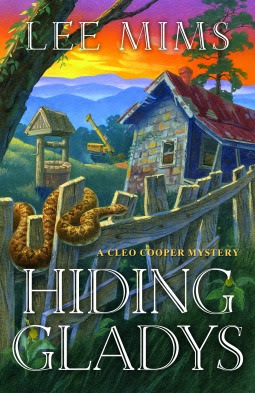 A little humor draws you into Cleo's life and that of her family, even giving Hiding Gladys a cozy aura.